4G in India has always been marred with various issues such as availability, download and upload speeds and so on. 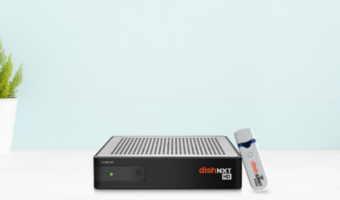 However, in recent times, things have changed a lot with increased download speeds and a whopping 96% of LTE coverage by a new entrant. OpenSignal, the network measuring firm recently released its report on 4G speeds offered by the country’s top four telecom operators- Bharti Airtel, Reliance Jio, Vodafone India and Idea Cellular during a ten-month period between May 2017 and February 2018. As expected, Bharti Airtel beats Jio and rest of the telcos in OpenSignal’s tests with an average download speed of 6 Mbps. Airtel is followed by Jio with 5.1 Mbps download speed and Vodafone, Idea secured 4.5 Mbps and 4.4 Mbps average download speed. OpenSignal, in its report, stated that throughout the summer of 2017, the overall speeds for Airtel, Idea and Vodafone were steady, but in September 2017, the overall download speeds staring rising on the three networks. 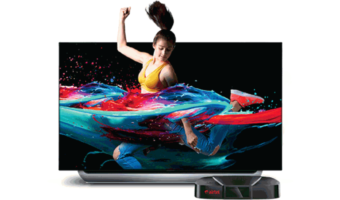 The three operators began expanding the reach of their LTE networks, which in turn resulted in overall speed increase in Airtel and Idea networks. Both Airtel and Idea registered almost a megabit increase of overall speed between May 2017 and February 2018. 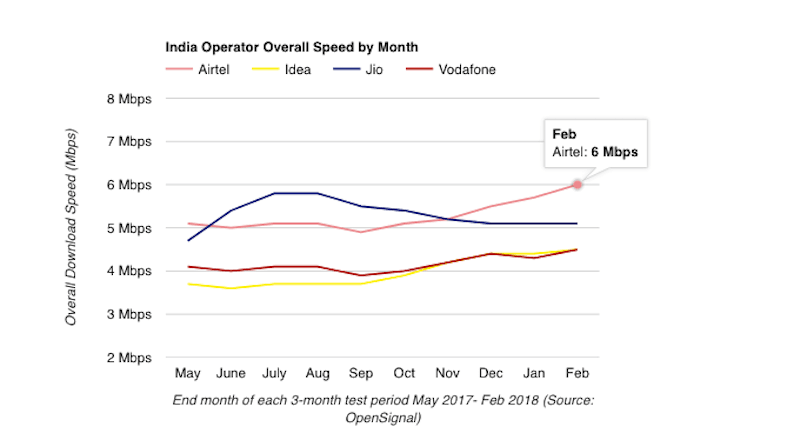 As a result, Airtel climbed into the lead in the overall speed metric in December, passing Jio, while Idea pulled itself even with Vodafone in the same timeframe. Moving onto the Jio’s trend line, it’s quite the opposite to three telcos. As a 4G-only operator, Jio’s overall speed score depends solely on the download speeds of its 4G connections, but there’s no lack of such connections in India, as Jio registered a whopping 96% of LTE availability on its network. OpenSignal cited that Jio’s 4G speeds suffered due to capacity problems. In Jio’s case, the chart shows a big spike in overall download speeds in May, June and July of last year, pushing it past Airtel. “That speed boost most likely represents network upgrades that boosted capacity on Jio’s LTE network. 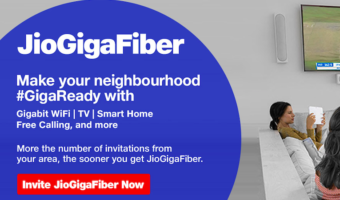 Once that new capacity was in place, Jio’s overall speeds began to level off in our measurements and then gradually drop throughout the rest of the year as customers began consuming that new bandwidth,” said OpenSignal. Reliance Jio ended February in second place in our overall speed metric, behind Airtel but ahead of Idea and Vodafone. The Trai speed test data report for the last few months also revealed that download speeds on Jio network are coming down gradually and the same has been pointed out by OpenSignal too. It will be interesting to see how Jio tackles this situation and takes the lead beating Airtel. Chetan, I have also used idea and they were use to be awesome in customer service but right now coverage is pathetic in Hyderabad. I’m not sure if one will be willing to go for such pathetic service. Coverage will improve this financial year!!!! !I also believe Airtel is not that good in most of the area!!!!!! Idea is begging through it’s agents so that it can increase some revenue and use that money to improve upon their pathetic services. But beware, in reality it is going to waste all your donations on those irritating silly ads on television. Think wisely before donating your money. I used to have Idea sim in college. My cousin also had Idea sim until Jan of this year when he ported out to JIO because Idea’s 4G data network is unavailable in half the city. Now he is happy with JIO in most places where he stays in. 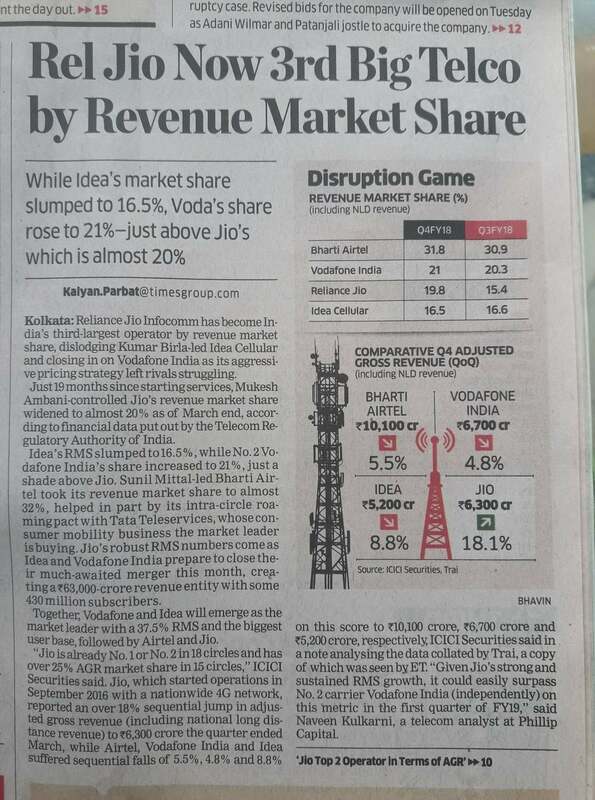 @ Girish : Vodafone-Idea doesn’t have band 41 in Karnatakathat’s why they have fell behind!!!!! They don’t have much back up spectrum as well!!!! !I hope they buy atleast 15 Mhz in band 1 and 30Mhz in band 41!!!! !I hope all this buyout and deployment comes in this financial year!!!!! Idea is sluggish in mumbai. Worst than MTNL. Kinda agree with you on idea being bad 8n Mumbai But airtel is definitively not as good as Voda or Jio in Mumbai. +1 for reply on Chetans comment on Spectrum spreadsheet!!!! !